Robert Lambert in World Cup action for Great Britain. Robert Lambert’s meteoric speedway rise shows no sign of stopping. The 17 year-old Panthers sensation has been named as one of two track reserves - along with Coventry man Jason Garrity - for the British Grand Prix at the Millennium Stadium in Cardiff on July 4. 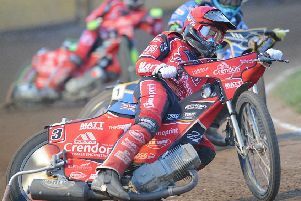 It continues a terrific 2015 campaign in which Lambert has impressed for Panthers and Elite League club King’s Lynn and made his mark on the international stage with fine showings in the Speedway Best Pairs and World Cup. Lambert missed out on the opportunity to battle for a wildcard place in the British GP after being overlooked for a place in the British Final by British Speedway Promoters’ Association (BSPA) bosses. Lambert had to withdraw from his semi-final after aggravating a previous hip problem in a crash and was then deemed not worthy of a wildcard spot in the final – a farcical decision given he has represented his county with distinction on the international stage. Lambert and Lewis Blackbird were among 16 British riders to take part in a track test at the Millennium Stadium on Tuesday. The Brits completed a 20-heat meeting with Lambert scoring 10 points from his five rides and Blackbird collecting six.